The NISS Affiliates Program acts as a forum through which academia, government and industry partners explore the emerging concepts, methods and tools of statistics, data science and related disciplines to support data driven solutions for business, government and society. Affiliate hosted conference expenses when co-sponsored by NISS. Affiliates participate in the planning and delivery of the annual slate of Academic Affiliate Program activities which can include workshops, course development, meet-ups and conference co-sponsorships. 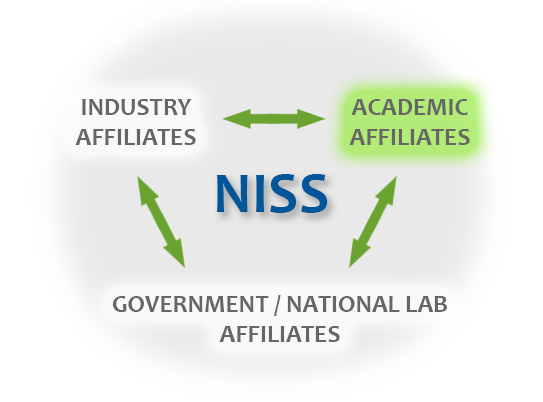 Affiliates have access to a rich set of colleagues in the statistics/data science fields through NISS’s academic, industry and government/national lab affiliates. Affiliates receive early posting (and priority consideration) for open Post-doc positions at NISS. Affiliates receive regular communications regarding upcoming NISS sponsored events and listings of open positions across academic, industry and government affiliates. The Affiliate department/program will be directly linked to the NISS web site and the Affiliate will be able to indicate their membership in the NISS Academic Affiliate Program (AAP) on their own web site. The NISS Academic Affiliate Program (AAP) Guide provides detailed information to assist Academic Affiliates in understanding how to efficiently and effectively utilize the many benefits available through the AAP. Academic Affiliates - Use the NISS Logo! Please feel free to display the NISS Logo on your departmental and/or conference websites to promote your membership in the NISS AAP! Simply link the image to the NISS website at www.niss.org! To save - click on the NISS Logo to the right. When it opens in a new window, 'Right click and Save as...'. Membership in the NISS Academic Affiliate Program has an annual fee of $3,000. If you are interested in becoming an Affiliate, visit our Become an Affiliate page (www.niss.org/affiliates/become-affiliate) and complete the application form. Or simply email the NISS office at officeadmin@niss.org.